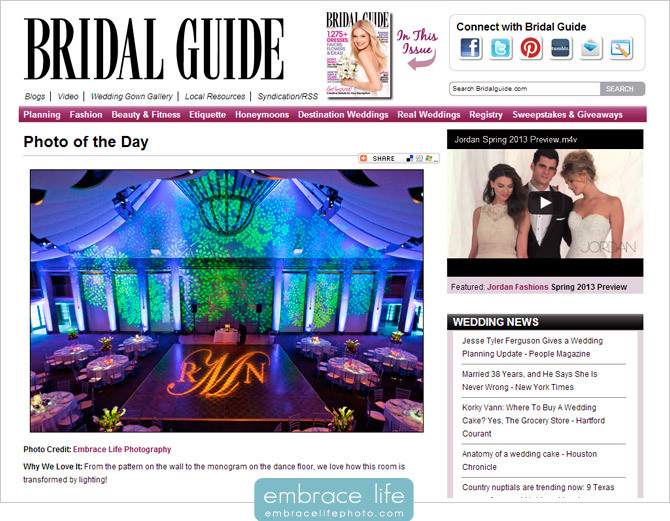 Yesterday, the home page of Bridal Guide featured three of our photographs of Nicole and Rob’s incredibly lit and decorated reception in the Ahmanson Ballroom at the Skirball Cultural Center in Los Angeles, California. As you can see, the combination of the purple wash, the green leaf pattern, the initial monogram on the dance floor, spot lighting on the centerpieces, and the Ahmanson Ballroom at Skirball Center’s incredible ceiling made for a beautiful, dramatic ambiance. To see more of this beautiful wedding, take a look at Nicole and Rob’s stunning, modern Skirball Cultural Center wedding photography album. Thank you Bridal Guide for the feature!